From left, Edgar F. Welsh, Megan White, presenter Edward W. Purdy II and James J. White IV at the award presentation. James J. White IV and Megan White were the honorees at the 30th annual Barry Award Dinner given by the American Catholic Historical Society (ACHS) Nov. 19 at the Union League of Philadelphia. James White is president of J.J. White Inc., a mechanical contractor firm that his great-grandfather founded in 1920. The couple was honored for their commitment to Catholic values and contributions through time, talent and treasure to the Church and the community at large. The Catholic Historical Society itself, founded in 1884, is the oldest Catholic scholarly organization in the country. 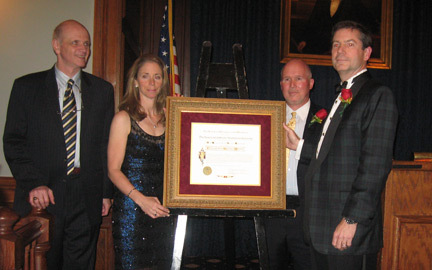 Its Barry Award honors the memory of Revolutionary War Commodore John Barry, a founder of the American Navy. “We are honored to be able to give this award to Jim and Megan for everything they have done for us and for Catholicism and non-profits in general,” said Edgar F. Welsh, president of the ACHS. The main task of the society, he said, was documenting and archiving American Catholic history. The chief historic endeavor of the ACHS is its award-winning quarterly, American Catholic Studies. A most important recent development, he believes, is the digitizing of all the past issues and documents by Villanova University, which make them more readily available to scholars throughout the world.